Davies happy after first day testing new bike. Chaz Davies admitted he felt like he was unwrapping a Christmas present after taking the wraps off his new bike. Davies focused his work on getting progressively more comfortable with the new bike, fine-tuning it to his needs and gathering plenty of useful data for the development process. The 31-year-old completed 61 laps in total, with a personal best of 1:51.180. 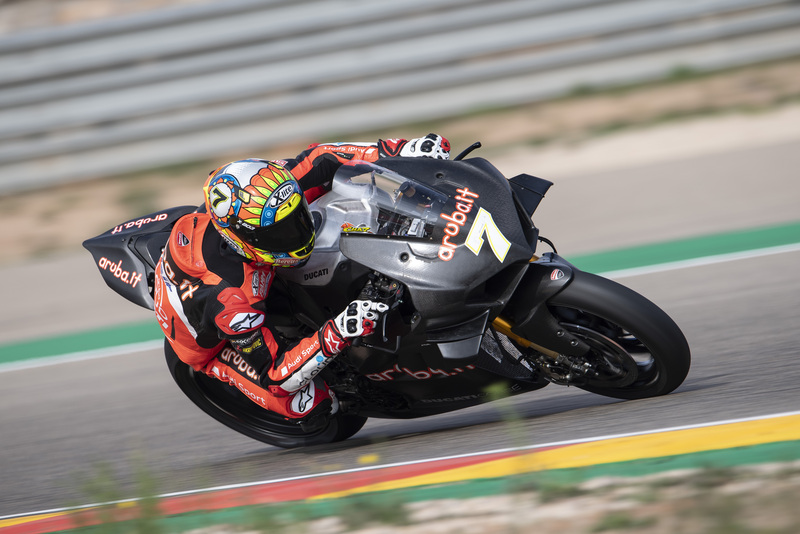 The Aruba.it Racing – Ducati rider will return to the track on Thursday with Davies for another day of testing ahead of its first collective outing, with Alvaro Bautista alongside him at Jerez in Spain on November 26 and 27. Davies testing new bike in Spain. “It was really exciting to take the Panigale V4 R out on track for the first time, it felt like Christmas, when you get a wonderful new toy to play with,” said Davies. ”Usually it takes me a bit of time to learn and understand a new bike, but honestly it felt the opposite today. I was really comfortable straight away, after the first out lap I felt like I wanted to push immediately, which is pretty cool. “Overall, it was a really positive day, we’ve made a lot of steps forward and finished most of the work on the ergonomics. “We have plenty of new things to evaluate and lots of data to process. The main goal today was to get progressively more comfortable with the bike and start tailoring it to our needs. Wales Have Depth, Versatility, And Winning Momentum . . . So, Bring ‘Em On!